On August 4, 2018, State Councilor and Foreign Minister Wang Yi attended the Foreign Ministers' Meeting of the Association of Southeast Asian Nations (ASEAN) Plus China, Japan and the Republic of Korea (ROK) held in Singapore. Wang Yi noted that since last year, the ASEAN Plus Three cooperation has shown strong momentum. Reviewing the cooperation course of the ASEAN Plus Three over the past twenty years, the most important experience is to respond to the times, to advance in history and to evolve in the era. At present, economic globalization has encountered setbacks with unilateralism and protectionism on the rise and international order and multilateral trading system being affected. Faced with new emerging uncertainty and instability, the countries of the ASEAN Plus Three must demonstrate their strong will in promoting trade liberalization and firm resolutions on maintaining multilateralism, firmly push forward the regional economic integration, build the East Asia economic community and build an open world economy so as to provide more stability and certainty for world economy. 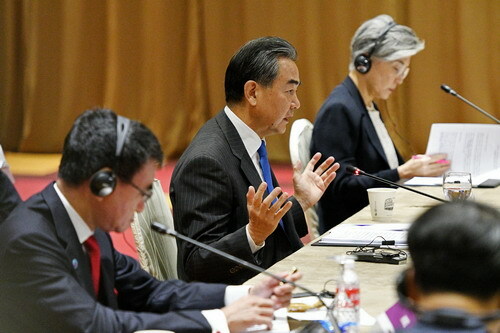 Wang Yi put forward several suggestions for the future ASEAN Plus Three cooperation. First, advance the regional economic integration and promote the negotiation on the Regional Comprehensive Economic Partnership (RCEP) to achieve substantial progress within this year. Based on this, the building of the East Asia economic community should be put on the agenda so as to foster a free, balanced, inclusive and universally beneficial East Asia development pattern. Second, deepen financial cooperation. We should continue to improve the regional financial safety network with Chiang Mai Initiative Multilateralization at its core and make full use of the Asian Infrastructure Investment Bank and the Asian Development Bank in a bid to provide financial support with more channels and at a lower cost for the countries in this region. Third, expand cooperation areas. We should enhance cooperation in innovation and promote such areas as digital economy, smart city, artificial intelligence and electronic commerce to be the new highlands for the ASEAN Plus Three cooperation. Fourth, establish a new platform for people-to-people and cultural exchanges. The Chinese side proposes the building of a cultural city network for the ASEAN Plus Three to strengthen the capacity building for the Network of East Asian Think-tanks and to enhance cultural connections among the countries in East Asia and friendship among peoples. 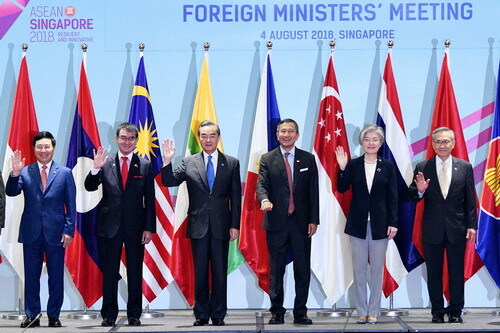 Foreign Ministers of Japan, the ROK and the ASEAN countries all positively appraised the fruitful results of the ASEAN Plus Three cooperation, and affirmed its positive role in promoting regional peace, stability and prosperity. It was unanimously agreed that in the face of the impact and threat of unilateral protectionism on the multilateral trading system, it was more important than ever to further strengthen the ASEAN Plus Three cooperation. The countries of the ASEAN Plus Three should strengthen unity, firmly support trade liberalization, oppose protectionism, and speed up the RCEP negotiations so as to promote the building of the East Asia economic community and maintain peace and prosperity of East Asia.